In today's fast-paced world, spending quality time with friends is more important than ever. And taking a trip with those friends can be a great way to bond and have fun. Casey Wohl has always been a travel lover, but it wasn't until she was going through personal challenges that she realized the true value of a getaway weekend with her girlfriends. She also appreciated the importance of proper planning for these trips. "My old college roommates and I always met for an annual reunion trip in Orlando," explains Wohl, a public affairs specialist who graduated from Rollins College and also has a master's degree from the University of Florida, "and we would inevitably find out that our favorite hangouts had closed, changed names, or relocated. And although our time together was always fun, we always had a much better time with proper planning and feedback from those familiar with the area." Although she searched for city-specific travel books geared toward women, she was unable to find any. Thus was born the idea for Wohl's unique new guide, Girls Getaway Guide to Orlando: Leave Your Baggage at Home. 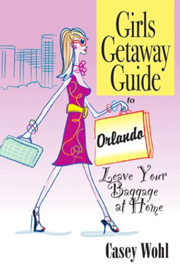 The book is geared toward women of all ages who want to get away with their girlfriends, as well as business travelers and convention goers who want to see some of Orlando while they are in town. Female residents new to Orlando will also benefit. Wohl--along with her girlfriends--has done extensive research on how to have the perfect girls getaway weekend in Orlando. Everything is covered--from where to stay, where to eat, where to shop, where to get pampered, where to get cultured, and where to have fun!